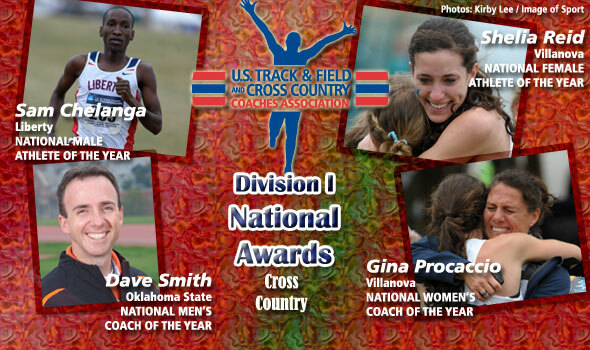 NEW ORLEANS – The U.S. Track & Field and Cross Country Coaches Association (USTFCCCA) announced on Wednesday that NCAA Division I Cross Country Champions Sam Chelanga of Liberty and Sheila Reid of Villanova were named as National Athletes of the Year for the 2010 cross country season. In addition, Oklahoma State’s Dave Smith was named the Bill Dellinger National Men’s Coach of the Year while Villanova’s Gina Procaccio was recognized as the Peter Tegen National Women’s Coach of the Year. Chelanga, a senior from Nairobi, Kenya, won the NCAA National Championship men’s cross country race for the second-straight season with a four-second victory over Arizona’s Stephen Sambu in Monday’s contest. Chelanga became the first back-to-back individual winner since Simon Bairu of Wisconsin (2004 and 2005). The fall of 2010 was an undefeated season for Chelanga as he won the third-straight NCAA Southeast Regional title of his career, the third-straight Big South crown of his career, and a captured a second-straight victory at this year’s Pre-National Invitational. Reid, a senior from Newmarket, Ontario, not only won her first NCAA national cross country crown on Monday, but she also lead the Wildcats of Villanova to their second-straight, and eighth overall, NCAA team title. With a 20:06.9 run in the 6k race, she topped Georgetown’s Emily Infeld by just over two seconds in the closest finish in NCAA women’s Division I history. Reid is also the first since Villanova’s Jennifer Rhines to win the individual NCAA title while leading their team to victory. Reid won the NCAA Mid-Atlantic Regional by 16 seconds to win a second-consecutive region title. Reid was also this year’s Big East Conference champion and a winner at the Penn State National. Smith’s Cowboys won their second-straight NCAA team title on Monday, joining an exclusive club that includes only nine other schools that have won back-to-back national cross country crowns. With 73 points, Oklahoma State topped Florida State’s 193 for the fourth-largest margin of victory in NCAA meet history. Juniors Girma Mecheso, German Fernandez, and Colby Lowe finished in the race’s top ten. Earlier in the season, Oklahoma State finished second in the NCAA Midwest Regional and won their third-straight Big 12 Conference team title. Smith has been at the head of Oklahoma State’s men’s cross country program for five years. Villanova’s women, coached by Gina Procaccio, won their second-straight NCAA team title and record-breaking eighth overall crown on Monday. Scoring two runners in the race’s top ten, the Wildcats were able to take a 120-154 decision over runners-up Florida State for the national team title. The back-to-back titles are Villanova’s first since winning six-straight from 1989 to 1994. In addition, Procaccio’s team won their second-straight NCAA Mid-Atlantic Region crown with a hard-fought, 29-40 victory over Georgetown earlier in the fall. Villanova finished the season undefeated and, along with a Big East crown, Villanova, won titles at the Penn State National and Notre Dame Invitational. Procaccio is in her 11th season at Villanova.